Stock product - detailed vector illustration - Invitation Festival Collection - Pizza Pasta Italian Cookery Vector - created by Aurielaki. Image formats EPS AI JPG. Pizza pasta Italian cookery vector images for festival invitations. Four black and white templates for trendy invitations or social graphics. Enjoy the power of vector images! 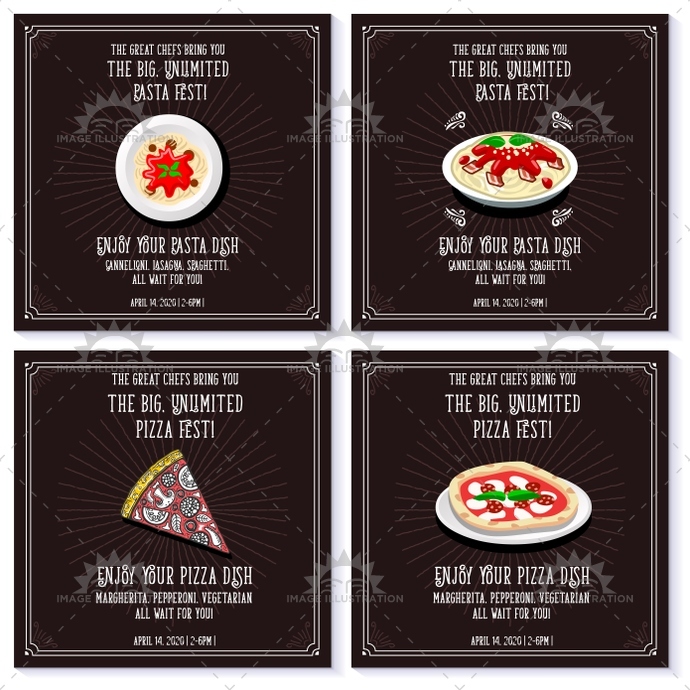 SKU: Pizza-Pasta-Italian-Cookery-Vector-Festival-Invitation-AurielAki. Category: Italian Menu Templates. Tags: art, background, black, booklet, brochure, cafes, clip, cookery, cooking, design, dinner, dish, drawing, easily, eatery, editable, fest, festival, flat, flier, flyer, food, frame, graphic, house, icon, illustration, image, invitation, isolated, italian, italy, layout, lunch, meal, pasta, picture, pizza, plate, poster, restaurant, set, simply, snack, social, street, template, text, tomatoes, vector.